An 11-year-old boy was brought for evaluation of unerupted maxillary anterior teeth. The deciduous counterparts had been exfoliated following mobility at the age of 8 years. There was no history of preceding trauma or toothache, and there were no associated symptoms as well. His medical and surgical histories were noncontributory. The child was born as a first child to parents who were not blood relatives. The parents had consulted a dentist previously about 1 year back with the same complaint and radiograph had been made. The parents were not cognizant about the diagnosis. They expressed their inability to follow-up with the clinician due to lack of accessibility of clinic. Extraoral examination revealed no abnormalities, whereas intraoral examination revealed missing deciduous maxillary right and left central incisors and left lateral incisor and unerupted permanent counterparts [Figure 1]. The alveolar mucosa in the region appeared normal. There was no evidence of eruption bulge, while the adjacent and other teeth in the oral cavity appeared normal. With simple delayed eruption in mind, an intraoral periapical radiograph and maxillary anterior occlusal radiograph were ordered [Figure 2]. The radiograph showed improperly formed maxillary right central incisor and left central and lateral incisors, while normally developing right lateral incisor. The teeth lacked root development, and there was indistinct demarcation between enamel and dentin. The pulp chambers and follicular spaces appeared wide. 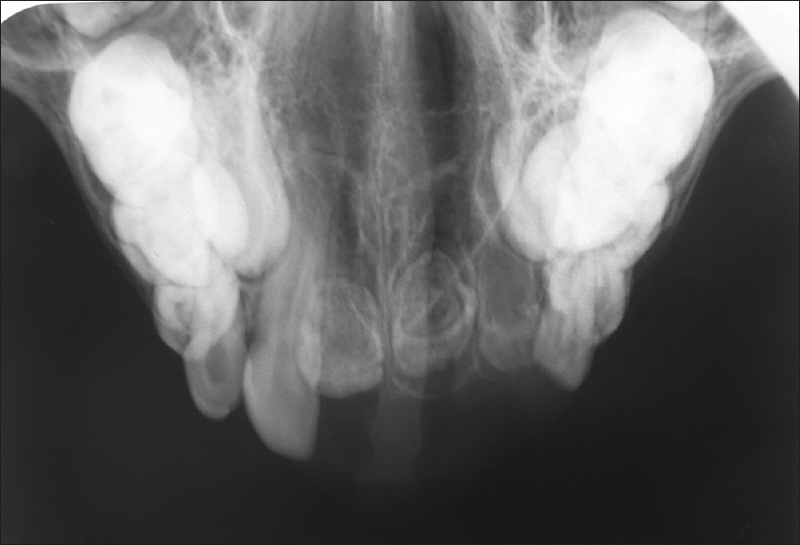 The previous radiograph made a year ago [Figure 3] showed similar findings, but upon careful observation, the right central incisor appeared to be less developed and mineralized than presently. The radiographic appearance was consistent with RO. A panoramic radiograph was made to rule out more generalized involvement which proved to be negative. The patient and the parents were informed about the condition and motivated for close follow-up. Further, they were educated about the “wait and watch” policy as there were more chances of the teeth erupting and normalizing in due course, the evidence of which was already seen through radiographs. Furthermore, a removable denture was fabricated for esthetics. The patient reported for a follow-up after 2 months with no further development of the ghost teeth. Despite motivation, the parents failed to bring the child for additional follow-ups. The affected teeth may fail to erupt, and if at all they erupt, the teeth may appear to be misshapen, discolored, and smaller in the dimensions. The color may vary from yellow to brown, may show grooves, and may be hypoplastic. Gingival enlargement is not an uncommon finding., Erupted teeth being caries prone may also develop periapical abscesses. The teeth may have short roots with open apices, and rarely, those teeth which fail to erupt remain in the bone impacted with pericoronal radiolucencies. These radiolucencies occasionally can be so large to be confused with a cyst or a tumor. Computed tomography has been recently utilized to study the ghost teeth as well as their pericoronal radiolucencies. The Hounsfield Unit for the radiolucencies has been determined to be equal to that of fibrous connective tissue, while of enamel, it was found to be lower than normal teeth indicating hypomineralization. It was additionally found that the hypomineralization was more severe in enamel than dentin. Much controversy surrounds the management of this unusual entity.,,,, Some advocate extraction of the affected teeth while others advocate retention.,, It is argued that extraction of affected teeth would prevent development of the alveolar bone and may also lead to psychological disturbances. Further, anecdotal cases of affected teeth eventually erupting and normalizing after a delay have also been reported. Auto-transplantation of unaffected teeth also has been suggested, provided, normal donor teeth are available. 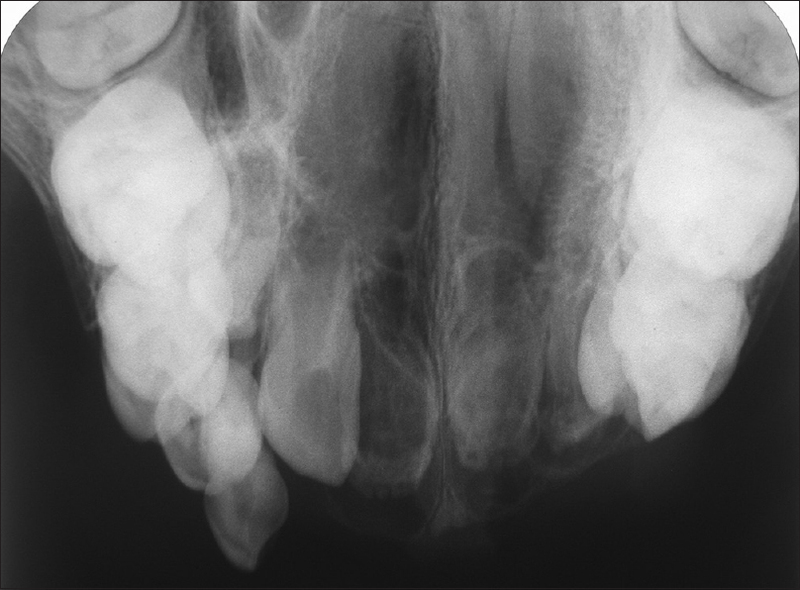 Some clinicians believe that affected erupted teeth will, in due course, develop periapical infection owing to hypomineralization and need extraction. Conversely, affected teeth that have survived for more than 25 years, without intervention, are also available. As much as the etiology of this rare entity needs a closer research, so does its management. As there are fewer reports worldwide, sufficient evidence regarding management is lacking. Anecdotal reports play a vital role in detailing the clinical and radiographic features of this rare anomaly as does the management. This paper illustrates the fact that affected teeth may still have the eruption potential, may normalize, and may refute the belief of extraction. Rashidian A, Zadeh AM, Azarshab M, Zarrabian T. Regional odontodysplasia: Report of a case. J Dent Shiraz Univ Med Sci 2013;14:197-200. Hamdan MA, Sawair FA, Rajab LD, Hamdan AM, Al-Omari IK. Regional odontodysplasia: A review of the literature and report of a case. Int J Paediatr Dent 2004;14:363-70. Cho SY. Conservative management of regional odontodysplasia: Case report. J Can Dent Assoc 2006;72:735-8. Gündüz K, Zengin Z, Celenk P, Ozden B, Kurt M, Gunhan O, et al. Regional odontodysplasia of the deciduous and permanent teeth associated with eruption disorders: A case report. Med Oral Patol Oral Cir Bucal 2008;13:E563-6. Courson F, Bdeoui F, Danan M, Degrange M, Gogly B. Regional odontodysplasia: Expression of matrix metalloproteinases and their natural inhibitors. Oral Surg Oral Med Oral Pathol Oral Radiol Endod 2003;95:60-6. Babu NS, Smriti RJ, Pratima DB. 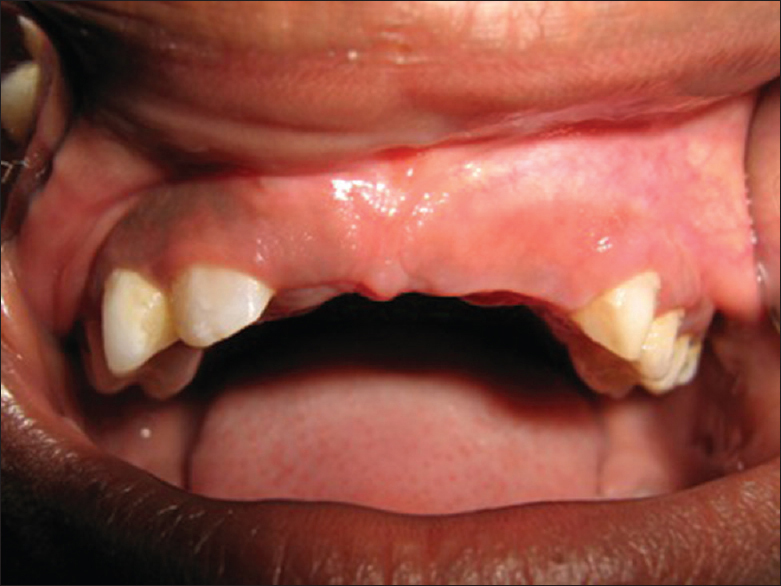 Regional odontodysplasia: Report of an unusual case involving mandibular arch. Contemp Clin Dent 2015;6:237-9. Gerlach RF, Jorge J Jr., de Almeida OP, Coletta RD, Zaia AA. Regional odontodysplasia. Report of two cases. Oral Surg Oral Med Oral Pathol Oral Radiol Endod 1998;85:308-13. Tervonen SA, Stratmann U, Mokrys K, Reichart PA. Regional odontodysplasia: A review of the literature and report of four cases. Clin Oral Investig 2004;8:45-51. Matsuyama J, Tanaka R, Iizawa F, Sano T, Kinoshita-Kawano S, Hayashi-Sakai S, et al. Clinical and radiographic findings and usefulness of computed tomographic assessment in two children with regional odontodysplasia. Case Rep Dent 2014;2014:764393.